3D printing is going to be big business, but that doesn't guarantee investing success. There's no question 3D printing is a big business -- and getting bigger. Stratasys Ltd. (NASDAQ:SSYS) and 3D Systems Corporation have staked out the largest positions in the industry, giving them a head start over competitors, but it's not smooth sailing ahead. Stratasys hasn't yet managed to become profitable and revenue has been stagnant for three years now. While I'm bullish on the industry and the company long-term, here's where that bullish investment thesis could go wrong. If you look at the chart below, you can see that Stratasys isn't set up to make money at its current revenue level. 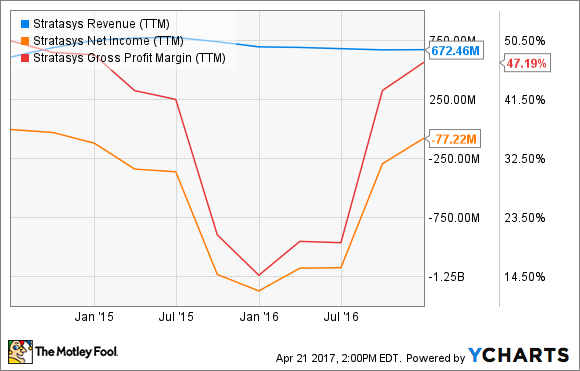 Margins are improving, but the company needs either more sales, higher margins, or lower operating costs to regain profitability. SSYS Revenue (TTM) data by YCharts. Margins will be tough to increase given competition, unless high-margin resin sales increase disproportionately compared to equipment sales. But Stratasys wants more equipment sales to increase the installed base of customers that could buy resin. The company also doesn't want to cut back on sales or R&D staff because those are the investments that will grow sales and improve products long term. If 3D printing volume -- both equipment and resin sales -- doesn't grow over the next few years, we could see financial losses persist. The bearish case is that sales have stagnated and Stratasys and others will be unprofitable for years to come, which is certainly possible. The 3D printing business is constantly changing, and manufacturers need to stay on top of their game to stay competitive. In the last decade, that's mainly meant improving material quality and making printing easier for a wider set of consumers, and more recently it's meant adding 3D printed metals to the equation. As technology changes, start-ups have come in and excited the market, gaining customers rather quickly. And there's no real brand loyalty in 3D printing, so if someone has a better product, customers are going to flock to it. The most notable purchase in Stratasys' history was the $403 million acquisition of MakerBot in 2013, which didn't exactly turn the former into a profitable giant in 3D printing. In metals printing there are other small start-ups that are trying to gain traction with customers, creating similar competition to the plastics 3D printing market a few years ago, where a half dozen companies are competing for the same pool of customers. Whether it's in plastic or metals printing, competition puts pressure on prices and operating costs like sales and research and development, making it tougher to turn the corner into profitability. And there's not yet an indication that Stratasys has such a strong position in the industry that it can't be upended by a thoughtful start-up or well-funded competitor. Will 3D printing really start taking off? For Stratasys, the bull case and the bear case come down to the same metric. If the company can grow revenue at a double-digit pace over the next five years, the bulls will likely be proven right. If growth stalls, or even goes negative, bears will win out. I think the future of the 3D printing industry is bright and with companies like Ford and Airbus now integrating the rapid production of plastic and metal products into their businesses, the momentum should pick up. But if adoption isn't as fast or as widespread as investors think, or if competition starts taking market share from Stratasys, the bears could win out. And it's worth understanding how they might be proven right long-term. David and Tom just revealed what they believe are the 10 best stocks for investors to buy right now... and Stratasys wasn't one of them! That's right -- they think these 10 stocks are even better buys.